I found a hidden gem tucked underneath the Crystal Pavillion’s food court on 50th and 3rd Av. Delicious tacos for lunch! Pampano Taqueria was born of the modern mexican restaurant Pampano (part of a chain of mexican restaurants) which is located upstairs from the Taqueria next to Smith and Wollensky. Pampano offers an extensive, high-end and sophisticated menu. The food is extraordinary, but so is it’s prices. 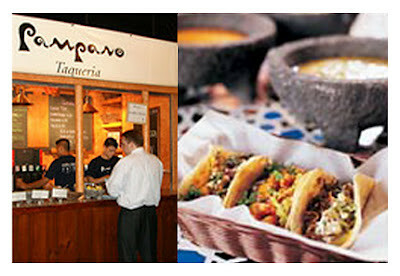 Which makes Pampano Taqueria a great alternative for us paisanos who are short on cash. Specially during lunch. The food is made to order and it comes directly from the kitchen of the restaurant. So it might take a little longer to get your order, but it’s so worth it. It’s always fresh and you can taste the quality of the ingredients. My favorite is the Carne Alambre Taco. Juicy and tender beef cubes, marinated and grilled to perfection, filled with melted Manchego Cheese and green pepper wrapped in their homemade tortillas. The Pescado Taco is also not to be missed. Filled with pan fried cubes of white fish marinated with spicy tomatoe sauce on a bed of crunchy shredded cabbage, the flavors are wonderful and that extra crunch is an interesting texture. To me, these 2 things are must haves! They also give u a bag of Homemade Tortilla Chips, extra crunchy, so what if it’s a bit greasy, they’re just too good to resist. By the counter, they provide spicy salsas in large mexican stone bowls, Super Hot, Medium or Tomatillo mild. Mix it up it you like, but be warned that the Super Hot is really really fiery so dip at your own risk. And don’t forget to add the chopped tomatoes, onions and cilantro, all for free, how good is that? I always get extra. And if your thirsty, get the Agua Fresca of the day. Usually a fruity flavored water. I like the Melon one the best.